vSignalyzer is a convenient tool for efficiently evaluating measurement data of all types. It gives measurement engineers extensive options for visualizing the data as well as functions for manual and automated analysis and reporting. 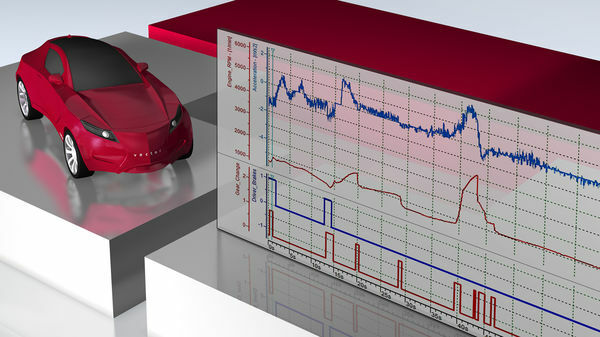 Measurement data recorded during the acquisition of physical values, network development, analysis and ECU calibration may be read-in from various file formats. The extensive function libraries and integrated data mining function lets you evaluate your measurement data manually or automatically with a focus on what is important. Powerful printing and reporting tools are integrated for documenting the results. vSignalyzer lets you focus on the measurement data that is relevant for you. You can easily create user control panels to control the analysis process and use them to visualize your measurement results. Even extensive evaluation functions and data mining computations can be fully automated and executed with just a few mouse clicks. This lets less experienced users conduct complex analyses with vSignalyzer as well. Due to its high degree of automation, you can also evaluate many very large measurement files, e.g. overnight. vSignalyzer provides you convenient options to simply and quickly print your measurement results or insert them into reports. The configurable print preview gives you a preview of the later document during evaluation. Drag & drop functions make it easier for you to paste results into external tools such as Word or PowerPoint. Evaluation of objective sensor data and subjective impressions during in-vehicle tests. Display of objects from bird’s eye view and superimposed on the video image of the Multimedia Window. Option Driver Assistance lets developers of driver assistance systems (ADAS) and systems for automated driving synchronously visualize logged sensor data in the Video window. Here the sensor data is superimposed on the video image as graphic objects (e.g. rectangles and lines) in a perspective view, and it is also visualized in a side view or bird’s eye perspective. Based on the video image, you can verify the acquired data to objectively assess the reliability and operational safety of the system, regardless of whether it is a radar system such as ACC, lane detection or a parking assistant. In addition to overlaying the acquired data on the video image, the data can also be displayed true to position on a map. Online map materials are available from OpenStreetMap. Offline maps from OpenStreetMap and Shobunsha Super MappleG may also be used. vMDM (Vector Measurement Data Management) is the solution for efficient management of large data volumes from development, test bench operation and vehicle tests. With vMDM, you can save your measurement data securely, protect it against unauthorized access and simplify the exchange of measurement data between distributed teams. Large-scale CPU-intensive analyses, classifications and reports are performed centrally on a server without any computational requirements on the engineer’s workstation. Familiar working environment through seamless integration with the Vector tool landscape. You define scripts, data analytics and data mining functions as usual in vSignalyzer or CANape. During the development and testing of all types of air conditioning and cooling systems, physical variables such as pressure and temperature are recorded at the test bench or test vehicle – usually together with other measured signals and internal controller values. To evaluate the system configuration and the employed components and coolants, engineers working in the field of air conditioning technology need specific ways of visualizing thermodynamic data. With the option Thermodynamic State Charts for vSignalyzer, you can now also display thermodynamic data synchronized with other measured data and generate highly informative state charts for offline analysis. Many different possible configurations for the individual design of the state chart types that are available for selection. Selection of thermophysical properties from the extensive TILMedia materials library from the specialist TLK-Thermo permit the use of both real gases and mixtures. Are you familiar with this situation? After months of testing, you discover some unusual behavior in a recent measurement file. You ask yourself whether this behavior is an isolated event or whether it has happened before. To find out, you could search through all of your measurement files manually, or you could use the “Data Mining” functionality that is available in CANape and vSignalyzer. In this webinar, you will learn – based on examples from practice – just how easily and quickly you can find user-definable events in a “haystack” of measurement files and how you can use the results efficiently. In this workshop you will acquire a fundamental understanding of vSignalyzer. You get to know the extensive options for visualizing the data as well as functions for manual and automated analysis and reporting.